The final U.S. Soccer Boys' Development Academy matches of 2018 will be played on Monday as the U-16/17 age group closes out the first portion of the 2018 Academy Winter Showcase. The crossover matches between select clubs have produced some thrilling contests, and teams have one more opportunity to set themselves up for a playoff push when the season resumes in the spring. The Development Academy Facebook page and the U.S. Soccer YouTube channel will bring you one final enticing feature game from Lakewood Ranch, Fla. The New England Revolution will look to close out 2018 with a win after two close matches to start the Winter Showcase. The Revs are possession-oriented, with the coaching staff encouraging collective and individual creativity. One player who exudes this philosophy is Damien "Tico" Rivera. The midfielder is deceptive and crafty, capable of swinging the pendulum New England's way in an instant with his ability to improvise. Not only is Rivera silky on the dribble, but he can score with either foot, as he has done on four occasions already this season. Just ahead of Rivera on the forward line is Andrew Serafino. The pacey striker has a nose for goal and a determination to finish off attacks. Described by head coach Pat Ouckama as the, "most consistent goal scorer in the group over the last couple of seasons," Serafino once again leads the Revs with six goals in the young season. At the other end, New England is back-stopped by Eliot Jones, who has already received multiple calls into U.S. Youth National Team camps. He is the team's main leader and will be one of the players responsible for helping forward Thaddeus Liquori and goalkeeper Matthew Tibbetts deal with the rigors of life at the U-16/17vlevel. Both players have been brought up from the U-15s for the Winter Showcase to gain some experience and prove that they can hang with the big boys. 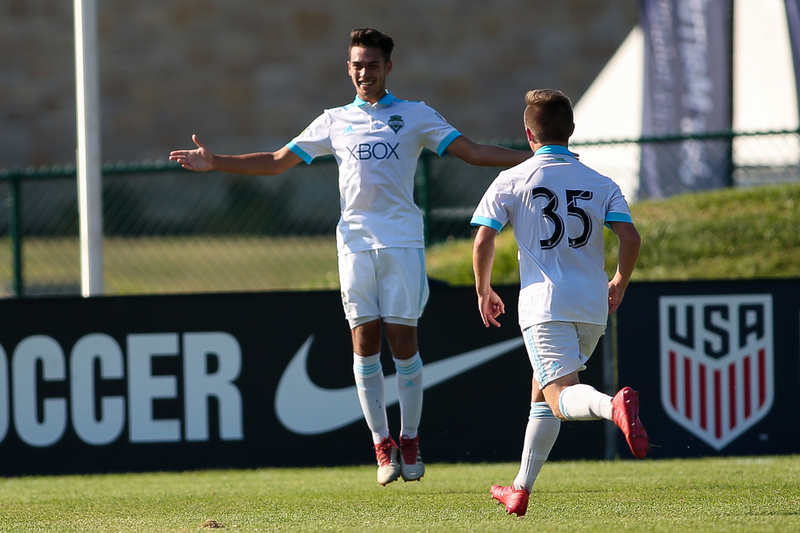 Defending U-16/17 Development Academy Champion Seattle Sounders FC bring a line-up that boasts seven players who have been in the U.S. Youth National Team set-up. Daniel Leyva, Ray Serrano and Soto Kitahara were instrumental in leading the Sounders to the title last season, and the Rave Green is off to another strong start in the Northwest Division. Serrano sits atop the team chart with seven goals in nine games played, but just as impressive is his vision. The Graham, Wash. native has the innate ability to pick out a pass that no one else on the field may see. The Seattle Sounders have won the Community Award the last two seasons, so their players and staff remain humble off the field, but when they are on their game and the attack is in full flow, they can be beautifully ruthless.